Despite research revealing 15 pubs are closing each week, microbreweries are emerging up and down the country. With this in mind, sixth-generation farmer Steven Holmes has turned to beer to secure the future of his family’s farm. Some of the best business ideas have been inspired over a pint in the pub with a good friend and in Steven Holmes’ case, one such concept soon became a reality. It began as an experiment in 2015 using his mum’s pots and pans and a bag of grain but quickly exceeded the realms of the farm shed he was operating in. Farm Yard Ales, near Lancaster, was borne out of necessity to secure the future of the Lancashire-based family, farm business, which had changed from a dairy unit to a mixed farming enterprise running arable, sheep and outwintering livestock across 34 hectares (85 acres). Sitting at the bar overlooking the brewery, the diversification appears seamless, as though it has always been operating from the farm, even though it’s only in the first phase of growth. It’s testament to Steven’s vision which has been dutifully supported by a combination of an extensive business plan, featuring cashflow forecasts and research, and various brewing and business development courses along the way. The building is just a stone’s throw away from the cow shed. 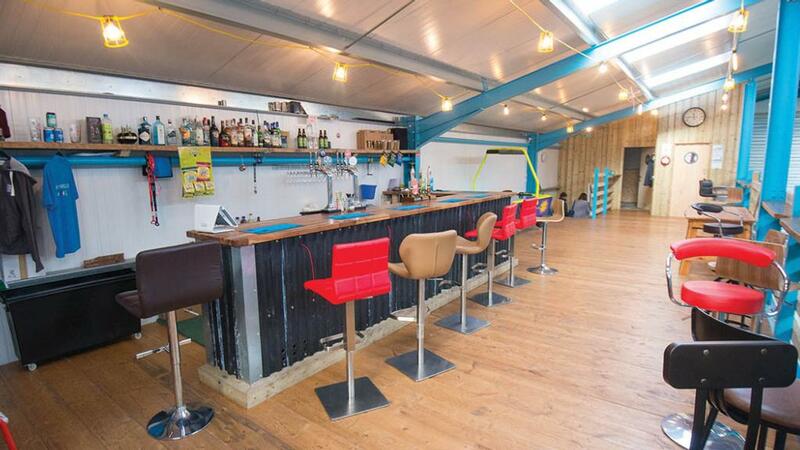 Walk inside and on the lower floor is the bespoke brewing area to the left with the cold storeseparated to the right. Upstairs houses the balcony bar which features their signature house blends alongside wines, spirits and the usual bar snacks. Despite temperatures outside falling to 3degC, the heaters blast from the ceiling and games, papers and other paraphernailia await the public who can take a seat at the wooden benches or watch Saturday’s brewing from the balcony. As with any new business, Steven has had his fair share of challenges which began after he approached the banks to borrow the initial funds needed. To this end, Steven secured the lending, invested his savings and applied for a Rural Development Programme LEADER grant to get the business off the ground. And to ensure the monthly debt is serviced, he works 10-hour shifts, seven days a week, driving a milk tanker in the evenings. Back on-farm, increasing production will continue to be a focus alongside the consolidation of the bar. It isn’t unusual, says Steven, to welcome up to 50 customers on a Saturday or Sunday, not bad given the only advertising has been through social media and word of mouth. The farm’s location is slightly off the beaten track, yet it is managing to attract a customer base from within a 50-mile radius. “I think people like the fact it is hidden away on a farm. Everything is open. You can enjoy a beer straight from source and see how and where it is made. The brewery is immaculate and the forest of stainless steel tanks are great to look at. Steven will soon be hosting days for landlords to visit and spend time seeing the product come intro fruition. “They can come and watch what we do, help brew it and then taste it. It’s important we build up a rapport so they can really invest in what we do and this helps define us from our competitors. With many microbreweries popping up round the country, what makes Farm Yard Ales one to watch in the future? “I like to consider ourselves an innovative business. Whether this be through our choice of packaging or branding, we are looking at ways to be different. While he describes his father being initially ‘edgy’ about his diversification idea, his mindset has well and truly shifted as he is now a regular behind the bar. “I am looking five years ahead. I want to push the boundaries of what beer is and develop the business further through exploring markets overseas including China and South Korea. He admits the grant application was initially a challenge, but it became a big part of Farm Yard Ales’ success and sustainability. “Applying for the grant was a really tough process but if you can put yourself through it, it can be really rewarding. The combination of funds facilitated the construction of a new building, housing the brewery and 400 casks. Four months ago, Darius Darwell joined the business as the head brewer, bringing a wealth of experience he achieved through 12 years of working in the industry. Together they developed their traditional and progressive core range, which gave the business the direction it needed and to understand itself in the booming market. The beers are divided between three types, traditional, progressive and specials. The first comprises Holmes Stead, a typical bitter; and Haybob, a traditional golden ale. The brewery’s branding captures the family farm and Steven’s grandfather, who is pictured with his Shire horses which were used to plough the fields and enter showmanship competitions. The progressive beers are marketed on their distinctive, American-style taste, while the specialist offering is a fruit-infused IPA using 30 kilos of blood orange and 20kg of pink grapefruit to produce a sharp and zesty beer. The production of all three types is intentional, as Steven explains. “We wanted to cover all tastes as it’s better to have a choice and we didn’t want to have two similar beers. A lot of breweries tend to offer either traditional or progressive. There are not many out there who offer a good mix of both and this is what we want to be known for. The brewery operates via one automated system and is producing about 6,000litres a week. 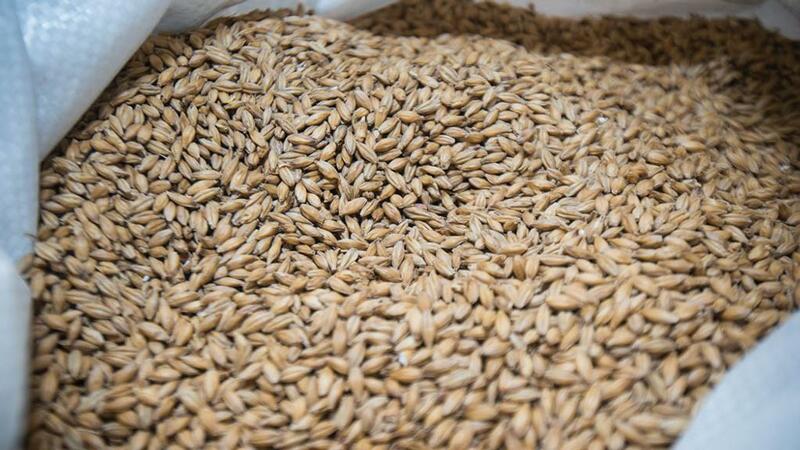 Around six-tonnes of whole British malt is bought in each month and then milled on-site. The crushed malt is combined with natural mineral water, taken from the farm’s well, at about 74degC to produce a mash which is the consistency of porridge. The spent grains are then fed to cows but not before being left for 60 minutes to extract the fermentable sugar, known as wort. The sugary liquid is transferred into the next vessel called the copper and boiled to remove any unwanted particles and sterilise the liquid. Early hops are added to achieve the bitterness required before late hops are added for aroma. After a 60 minute boil, a whirlpool is created which allows the hops to form a cone. The beer is then transferred at 18degC through a heat exchanger and into a fermentation vessel before the yeast strain is added. The yeast chews through the sugar and turns it into alcohol and, after fermentation, the beer is packaged in casks, kegs, cans and bottles. While many breweries opt to showcase their alcohol in glass bottles, Steven has recently launched his products in 330ml cans, something he is keen to develop through his own canning line. “Glass bottles are 98 per cent effective against UV lights, which can ruin beer, whereas cans are 100 per cent,” he says. “Cans do not break, plus they are lighter and fully recyclable. Although 90 per cent of sales remain local, Steven is supplying to outlets across the country and also uses the website www.eebria.com, an online portal sourcing craft alcohol from small producers.